The deposit holds your space and the balance is due when you arrive to start class. Due to the preparation necessary for each student (preparation which begins immediately after deposit is received), all deposits are nonrefundable. However, deposits can be transferred to other classes and services at Kimberly Jentzen’s Studio. This three session plus one-month of Ongoing Class is designed to ease the actor into the Ongoing Class. Each session is complete with new techniques from Kimberly’s book, Acting with Impact: Power Tools to Ignite the Actor’s Performance. 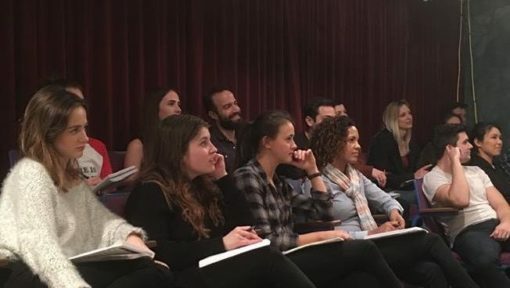 The Jentzen Technique brings power and clarity to the actor’s preparation and process and provides a foundation so that the actor can enter ongoing class with confidence. POWER TOOL: EMOTIONAL CONTENT and EXERCISES: expanding your emotional range with the imagination. POWER OF STRENGTHENING THE ACTOR’S FOCUS: being an artist in a business. POWER OF IMAGES and VISUALIZATION: Lightness and Ease Exercise to ignite the actor’s concentration, focus and imagination. POWER TOOL: INNER ACTIONS with EXERCISES: Build on the tools that give you an edge in every reading and performance. POWER TOOL: GENRE: Film, Television, Drama, Sitcom, Dramady and Comedy. INDUSTRY DISCUSSION and Q & A: the anatomy of the Entertainment Industry, Kimberly’s insights on how to set yourself up for success and create opportunities and a sustainable career.